America is in the midst of an energy revolution. For the first time ever, the dream of energy independence finally seems attainable. By 2015, the United States is projected to become the world’s top oil producer, surpassing both Russia and Saudi Arabia, to put the country on track to achieve total energy self-reliance by 2035. How have we arrived at this point? In a word: shale. Thanks to technological advances, extracting resources from the huge shale formations that lie beneath the ground in key places across the country has become commercially viable. In the past, shale gas wells were vertical, and accessing these formations just couldn’t be done effectively or affordably. But combining horizontal drilling with hydraulic fracturing (or “fracking” that blasts water, chemicals, and sand into a well to fracture the formation and release trapped oil and gas) has made it possible to efficiently tap our underground resources. 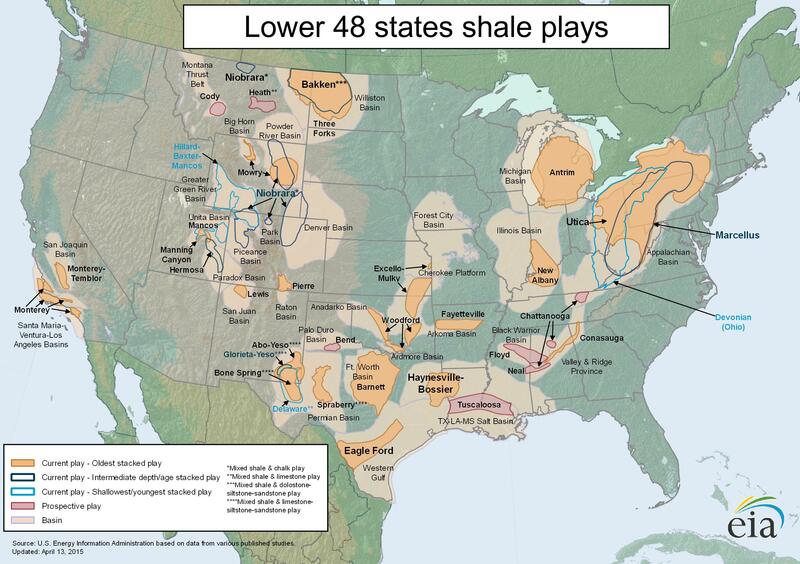 There are nearly 40 known shale plays across the United States. But owing to shale’s natural characteristics, each formation offers unique properties that require equally unique treatment. Some plays hold more resources – or can be tapped more easily – than others. 1. Eagle Ford: While it’s only been tapped for about 5 years, the Eagle Ford has quickly become one of the nation’s most important shale plays. In fact, it is the world’s fastest growing shale play with a 160-fold increase in permits in just a 4-year span. Stretching across 20,000 square miles in southern Texas, the Eagle Ford could contain up to 10 billion barrels of recoverable oil. But what makes the Eagle Ford truly special isn’t just the quantity of oil it’s pumping out, it’s the quality. 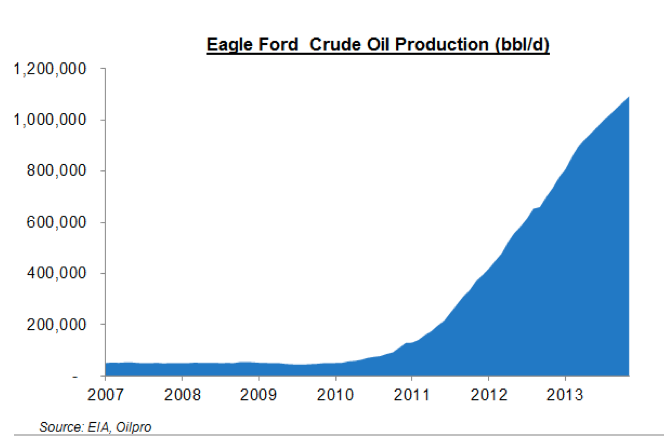 Eagle Ford oil is some of the most valuable crude in the world. Characterized as “exceptionally light and sweet,” this crude is inexpensive to refine. And because the play is near metropolitan hubs in Houston and Corpus Christi, transporting it is quite economical. Furthermore, the Eagle Ford beats other traditional shale plays in both oil and gas production. The formation’s high percentage of carbonate shale is largely to thank as it is more brittle and allows for easier fracking. Combine all of this with declining drilling costs, and it’s no wonder the Eagle Ford tops the list of major shale plays in the US. 2. Bakken: The Bakken was named after the North Dakota farmer who owned the land where the formation was originally discovered back in 1951. Back then, the technology didn’t exist to tap the resources in the formation, but as unconventional technologies have emerged, the region has become ground zero for the shale revolution. In April 2013, a USGS survey estimated that the Bakken would produce a total recovery of 7.4 billion barrels of oil. The formation’s remarkable production has helped North Dakota become the second-largest oil production state, behind only Texas. What makes the Bakken such a bonanza is its highly-pressurized source rocks. The formation’s high pressure contributes to high initial production rates for drills. It also suggests that the oil is contained tightly within the source rock itself. 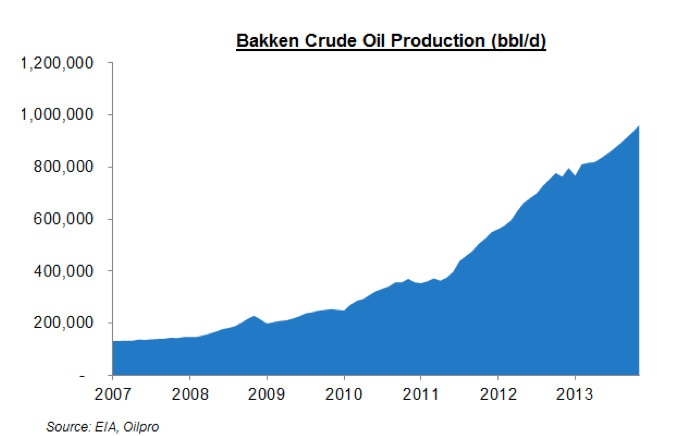 As of early 2013, the Bakken was producing about 779,000 barrels of oil per day, accounting for 11% of total U.S. production. It’s expected to soon eclipse 1 million barrels of oil per day in production. 3. Permian Basin: The Permian Basin is home to numerous promising shale plays, including the Cline, Wolfcamp, and Spraberry. The region currently produces about 900,000 barrels of oil per day, and that number is only growing. 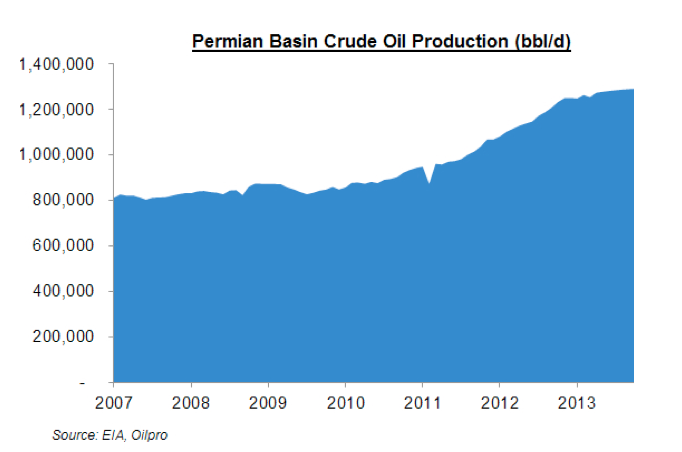 Within the next 5 years, the Permian Basin is projected to pump out a jaw-dropping 2 million barrels of oil per day. The Permian’s most appealing characteristic is its “stacked pay potential.” Imagine having 6 Eagle Ford formations stacked on top of one another. That’s what the Permian Basin offers. With a pay zone up to 1,800 feet thick in some locations (compared to about 250 feet thick in the Eagle Ford), drillers are able to target multiple areas with a single vertical well. When all is said and done, the Permian Basin could be the world’s largest oil and gas discovery. 4. Marcellus: With about 80% of wells in the region focused on natural gas production, the Marcellus Shale produces about 20% of the nation’s daily gas supply. The formation, located primarily in Pennsylvania, is expected to contain more than 500 trillion cubic feet of natural gas. If only 10% of this gas is recovered, it would still be enough to supply the entire country with natural gas for about two years. Experts attribute the formation’s massive natural gas resources to its depth and thickness. The Marcellus is located 4,000-8,500 feet beneath the earth’s surface, and thickness ranges between 50 feet to 200 feet. A rich organic composition from plants and animals compressed over the course of millions of years has helped trap natural gas in the formation’s fractures. With such abundant resources and its nearness to large Northeastern US energy markets, the Marcellus is attracting developers and has a bright outlook for years to come. 5. Niobrara: From day one, the Niobrara play showed enormous potential. When the wildcat oil well “Jake” was first drilled in August 2009, it produced 50,000 barrels of crude oil in just 90 days. This signaled the beginning of an oil boom, one that today is still in its earliest stages. 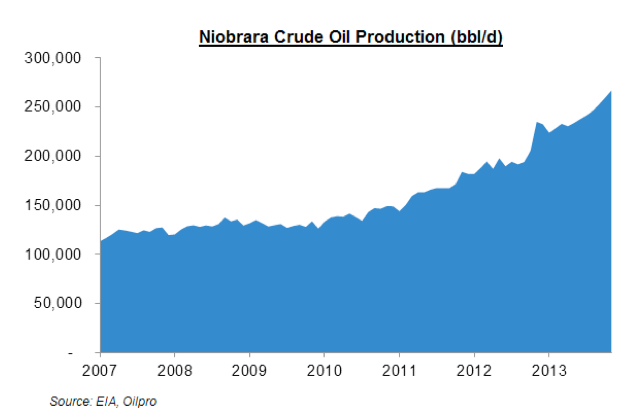 Thanks to the Niobrara, the state of Colorado is seeing its highest levels of oil production in more than 50 years, with a 46% increase in total production from 2009 to 2012. Because development in the Niobrara is still in its infancy stage, analysts are still struggling to assess just how much recoverable oil lies beneath the surface. Some believe it could hold about 2 billion barrels of recoverable oil, a respectable amount that promises a bright future for the region. 6. Haynesville: The play that stretches from Northeast Texas to Northwest Louisiana is expected to contain a wealth of resources. Five years ago, the Haynesville earned the label as the largest gas field in the US. In early 2011, the Haynesville actually surpassed the Barnett as the nation’s highest-producing shale gas play. And while production has since gone down, it’s still believed that 75% of its resources still haven’t been recovered. More than 2,400 wells have been drilled across the play to date. Plummeting natural gas prices led to a decline production from this formation. But as natural gas prices climb back up, the Haynesville is once again attracting the attention of oil and gas companies who are returning rigs to the region. Considered “the grandfather” of all shale plays, the Barnett of north-central Texas’ Fort Worth Basin contains one of North America’s largest onshore natural gas fields. Since 1993, the play has yielded more than 13 trillion cubic feet of natural gas, exceeding an average 3 billion cubic feet daily – and speculation promises that more than 24 trillion cubic feet more is technically recoverable. A typical Barnett well is very productive for extended periods and enjoys fairly level production after an initial decline over the first few years. Like the wise old grandfather, the Barnett has influenced E&P practices for other fields. Years of experience and innumerable successes have made drilling here an education for its younger, less mature counterparts around the country. It’s even a trend-setter for recent technological advances like urban “pad drilling” (with multiple wells from a single location) and frac water recycling methods. Age has its drawbacks, too: Some analysts predict that the Barnett has already reached its production apex. Drilling is down overall in the Barnett, leading some to question the play’s lifespan. 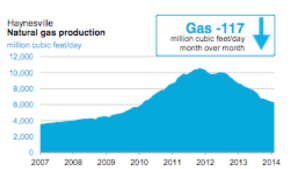 Despite this tapered activity, though, production increased to its September 2011 peak of 6 million cubic feet of gas per day. So even though the Barnett didn’t make the EIA’s “Top 6” list, Granddaddy still has a few tricks up his sleeve! Of course, the domestic shale revolution isn’t limited solely to the huge plays in the media spotlight. 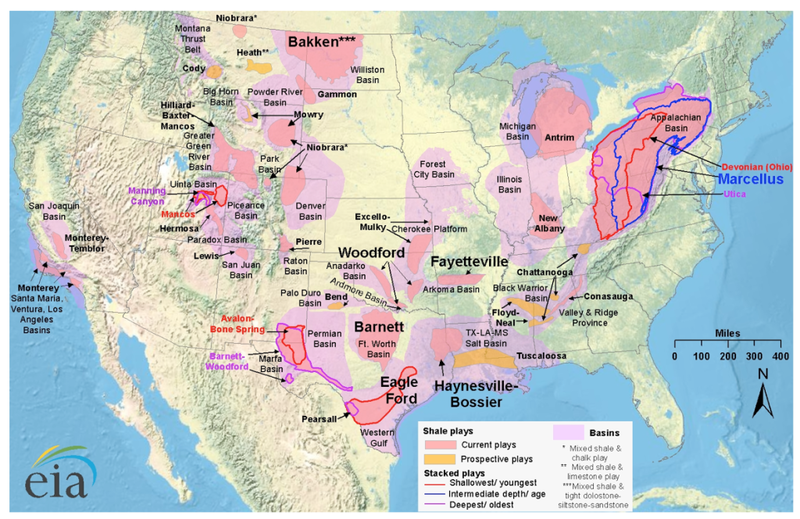 There are many more very important shale plays that, while not as prolific as the major plays detailed above, still play a very important role in the nation’s quest for energy independence. Fayetteville: With an estimated 38 trillion cubic feet of technically recoverable gas reserves, this northern Arkansas formation is one of the most productive shale gas basins in the country. 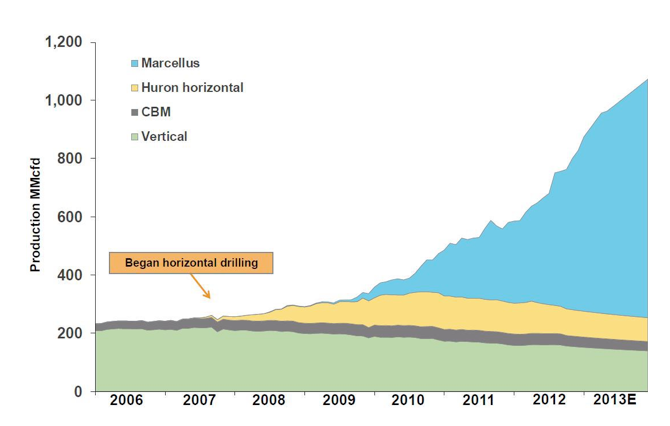 Despite declining production in recent years, the formation still holds a lot of gas. A 2014 study from the Bureau of Economic Geology (BEG) at The University of Texas at Austin predicts that the Fayetteville will continue to be a key contributor to US natural gas supplies for many years to come. 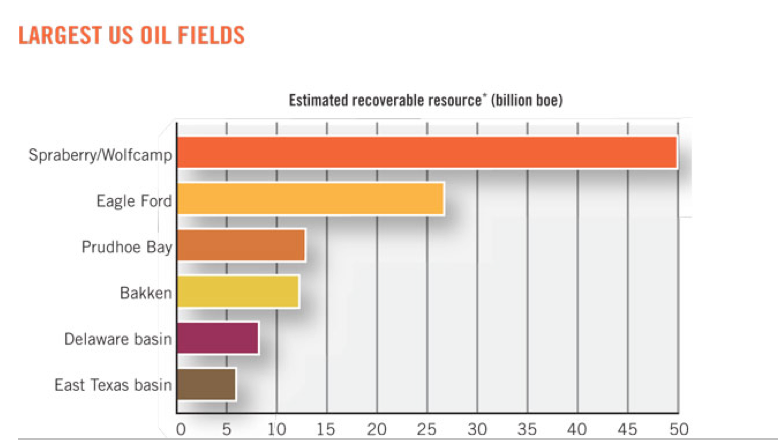 The forecast calls for a total of 18 trillion cubic feet of economically recoverable reserves by 2050. Utica: Spanning parts of Ohio, Pennsylvania, New York, West Virginia, and Quebec, the Utica is located underneath the Marcellus. The Utica’s potential, for the moment, is mostly speculation: Its great depth and inconsistent composition give geologists reason to expect many dead zones, and some drillers question if it will be economically feasible to extract the formation’s vast resources. But early predictions have caught the attention of developers, who see tremendous potential in estimates that the Utica could contain as much as 940 million barrels of oil and 38 trillion cubic feet of natural gas. Woodford: The gigantic formation underlying much of Oklahoma has catapulted the state into prominence as a key player in the shale revolution. In fact, production in Oklahoma is growing faster than in any other state besides Texas and North Dakota. This diverse play holds a lot of potential: With estimates that the Woodford could contain as much as 4 trillion cubic feet of gas and 400 million barrels of recoverable oil, numerous oil and gas companies have filed in to try to strike it big. One developer called the Woodford “one of the thickest, best quality resource shale reservoirs in the country.” Because the formation is so widespread, its characteristics change significantly based on location. The western portion, for example, tends to be gas-rich, while the eastern area is much more oil-rich and condensate-rich. The oil and gas landscape seems to change almost by the day. While the major shale plays will likely continue to hold their place atop the production charts, budding plays are also capturing the attention of the industry. Wolfcamp: As emerging shale plays go, the Wolfcamp is the granddaddy of them all. It could be the Permian Basin’s shining star: With some industry experts saying it could become “the largest oil and gas discovery in the world,” the buzz surrounding this hot play is deafening. Based on estimated recoverable resources, the Wolfcamp is the largest onshore play in the US and second in the world to only Saudi’s Ghawar Field. While developers have known about the Wolfcamp since the early 1920s, it had always been nonproductive shale that simply didn’t allow for commercially viable drilling. Of course, that was before the advancement of horizontal drilling and fracking technologies made tapping the Wolfcamp’s vast resources a real possibility. As operators continue to explore and develop the Wolfcamp, it will become clearer if this play will become the largest the country has ever seen. Buda: While the Eagle Ford is the most successful South Texas shale formation, other important rock layers that are producing oil or gas sit adjacent to it. One such promising formation is the Buda Limestone, which lies below the Eagle Ford. Developers have long known of the formation, but it wasn’t until a “sweet spot” was recently discovered that the play piqued serious interest. The Buda’s sweet spot, found in northern Dimmit and southern Zavala Counties, has started producing surprisingly economical results for three different oil companies. In fact, the wells located in the Buda hot spot could have better drilling economics than Eagle Ford wells. An average Eagle Ford well costs between $7 million to $8 million to produce results. A Buda well, on the other hand, costs under $4 million. The reason? It doesn’t have to be fracked because the limestone formation is naturally fractured. It’s these simple economics that have developers excited about the Buda’s remarkable potential. Tuscaloosa: So far, not a lot of people have heard of the Tuscaloosa Marine Shale, but that doesn’t diminish the potential of this emerging play. Extending from central Louisiana into southwestern Mississippi, this 6.6 million-acre shale play is said to hold upwards of 7 billion barrels of oil in place deep beneath the surface (estimated depth ranges from 10,000 feet to 15,000 feet). The foreseeable future is bright for US shale plays. According to the International Energy Agency, domestic oil production is expected to increase to 11.6 million barrels per day in 2020, compared to 9.2 million per day in 2012. 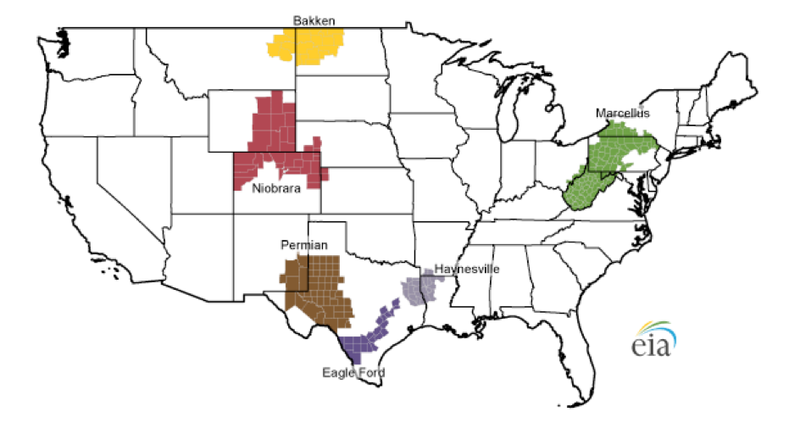 In 2001, shale gas accounted for just 2% of the nation’s domestic gas resources. A decade later, that number shot up to over 25%. While unconventional gas plays accounted for 42% of total US gas production in 2007, experts project it will account for nearly 65% in 2020. The Shale Revolution is still young. As it continues to progress, it’s a safe bet that the landscape of major shale plays will continue to change with time. This is amazing! This may be a silly question, but do any other countries use fracking to extract oil? Is it just something big going on in the States?